The expansion of the Vegetationmap4africa map to Burundi was supported by the Australian Centre for International Agricultural Research (ACIAR) through support to the project Improving Sustainable Productivity in Farming Systems and Enhanced Livelihoods through Adoption of Evergreen Agriculture in Eastern Africa (FSC/2012/014), implemented by the World Agroforestry Centre. The map include contributions from the Ph.D. project 'Changing environments under future climates' funded by Danida. Updates and improvements to the species distribution and species selection tools were made possible thanks to support from the CGIAR Research Program on Forests, Trees and Agroforestry (FTA; supported by the CGIAR Fund Donors). Development and maintenance of the website and the online, offline and mobile maps by Spatialdynamics. This version incorporated contributions from the Ph.D. project 'Changing environments under future climates' funded by Danida. The preparation of the national atlases were made possible thanks to support from CGIAR Research Program CCAFS. The first version of the map was developed by the VECEA project, made possible thanks to funding from the Rockefeller Foundation. support from SIDA/SAREC and grants from the Carlsberg Foundation to the Ethiopian Flora Project. Support from UNEP-GEF to the Carbon Benefits Project (CBP) through which information was compiled on indicator and characteristic species for The Vegetation Map of Africa (White 1983). 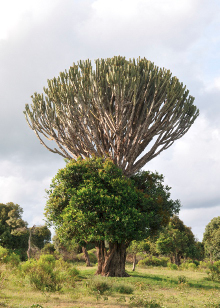 (This work led to the publication in 2011 of an Africa-wide tree species selection tool that is available from: http://www.worldagroforestrycentre.org/our_products/databases/useful-tree-species-africa) . Support from BMZ for funding the ReACCT project in Tanzania through which funding was made available for field verification of the Vegetationmap4africa map around Morogoro (this was essential in preparing the Vegetationmap4africa map as the base map for Tanzania was essentially a physiognomic map. the Assistance provided by Meshack Nyabenge (ICRAF) and Jane Wanjara (ICRAF) for digitization of maps. comments and suggestions that were made by Paul Smith and Jonathan Timberlake (both of Royal Botanic Gardens Kew) when they reviewed early drafts of volumes 2, 3, 4 & 5. Contributions from colleagues in our institutions who contributed directly or indirectly to the completion of the Vegetationmap4africa vegetation map and its associated documentation. We especially appreciate the assistance by Nelly Mutio (as for organizing logistics for the regional workshop that we organized in 2009 and for assisting in administrative issues), Melita Jørgensen (for desktop publishing), and of Jeanette van der Steeg for helping with the final preparation of the maps for Volume 1. Sharing of the digital map “Vegetation of Volcanoes National Park” by Eugene Kayijamahe from the Center for Geographic Information System and Remote Sensing at the National University of Rwanda.